An Australia-based writer has released his debut fantasy book, which takes readers on an adventure-packed journey to a supernatural world that lay thinly veiled beneath reality, where mystical abilities and qualities are wielded by all. 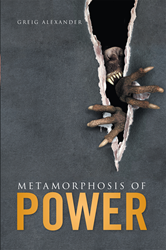 “Metamorphosis of Power,” by author Greig Alexander, follows the story of 31-year-old protagonist Damien as he navigates through the murky waters of his humanity and learns to convert into his true form. Through Damien’s experiences of love, loss, friendship and personal sacrifice, he strengthens his understanding of who he truly is and embarks on a journey to wrest power from enemy organizations and restore it to his newly discovered supernatural comrades. Through his book, Alexander pulls back the curtain of the modern world, revealing an imaginative, secret society embedded within humanity’s understanding of itself. Readers will be gripped and ready for more as they share in Damien’s journey and unravel his ultimate fate. Greig Alexander holds a bachelor’s degree in business and economics and is pursuing a master’s degree in business administration. Alexander is an animal lover, fantasy enthusiast and martial artist. He currently resides in Adelaide, Australia.